Here the bold shows the words 'as published' in the CDM, the notes and annotations hopefully make things easier. Duple means that you have to think in terms of pairs of couples. Typically you work out which other couple you are dancing with by taking 'Hands Four' down the set. This makes sure the couples know which direction they are going. The two couples do different things during the dance, as normal the couple closest to the band are conventionally called the 'first couple' and the other's the 'second couple'. Proper means that in this case all the men really are on one side of the set and all the ladies are on the other. The alternative is Improper ⬀ where the caller shouts out that the first couple change places ( Holmfirth Reel is a Longways 'Improper' dance). The dance is progressive even if the description doesn't say so, longways dances are normally progressive I suppose and the 'duple' also implies this. Progressive means that you find you move up or down the set, each time through the dance you have swapped places with the couple you were dancing with. It also means that you have a surprise when you get to the end of the set. This bit will probably be called as first corners swing. Maybe the best way to link right arms is to cup the other person's elbow with your palm, they'll thank you if you don't grab hold their arm with your thumb. You are likely to leave bruises. It's probably best not to get confused by the reference to Drops of Brandy, yes, you are doing a right arm turn but the music, stepping etc will be quite different. ... Bars 5-8: 2nd man and 1st girl do the same. No reason, of course, why the two who danced first should stop stepping.... just make sure you are back out of the way of the second corner. On the way back up the set the first couple carry on, they part and turn round the back of the twos, the first man will be going left round the second man and the first lady will be going right around the second lady (this is the cast⬀). The idea is that the first and second couples change places, with the first couple one place further away from the band and second having moved one place closer to the band. Watch out that with everybody swinging you're unlikely to get much space to dance in, a long narrow step-hop swing can work if the music allows. If you've got to the end of the set and are ready to swing - and nobody is there? Don't panic, there will be one time through the dance where you'll be watching and someone will join you. You will see the four people next to you in the set doing the first corner swing, second corner swing, chassé and cast. When everybody swings, you can swing too..
And you continue, but with a bit of magic, if you had been a 'first couple' dancing down the set, you will start dancing as a 'second couple'. Vice versa, the couple who had reached the top of the set, having danced as a second couple all the way up now starts dancing as a 'first couple' and dancing down. The "Nottingham Swing" started the hunt for local dances in Northants. 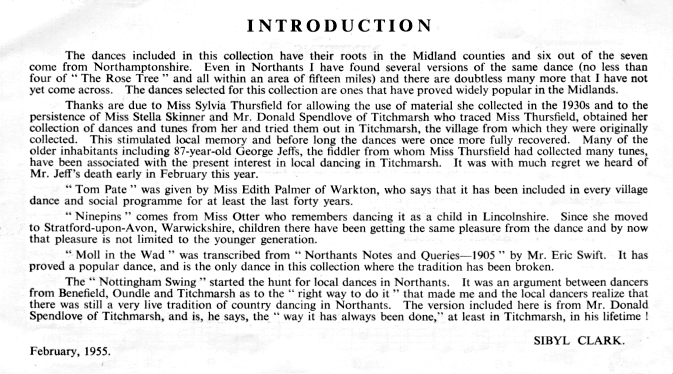 It was an argument between dancers from Benefield, Oundle and Titchmarsh as the "right way to do it" that made me and the local dancers realize that there was still a very live tradition of country dancing in Northants. 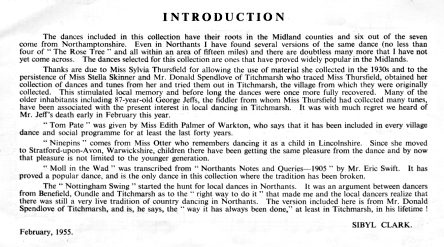 The version included here is from Mr. Donald Spendlove, and is, he says, the "way it has always been done," at least in Titchmarch, in his lifetime! Difficult to do better than The Solstice Reel (from Jason Little) as per Rufus Return who play it as a schottische and not a hornpipe. There's a clip provided by Rufus Return and ABC and notes on theSession. A version has also escaped into the International Folk Dance repertoire.